This is the 4th target date for the pickup. Mahindra & Mahindra Ltd. now is aiming for the end of this year to begin U.S. sales of its Indian-made compact diesel pickup -- the company's fourth launch target. "By the time the vehicles are in the hands of dealers here and ready for consumers, it will be the end of the year," Pawan Goenka, president of Mahindra's automotive sector, told Automotive News last week during a visit to the United States. "We don't see anything that could come in the way of this timeline." Goenka said Mahindra has completed emissions testing and will submit paperwork to the EPA this month. EPA certification is required before Mahindra's independent importer, Global Vehicles U.S.A. Inc., can accept orders. "We are expecting, optimistically, to receive certification by the end of June. More realistically, by the end of July," Goenka said. "So by end of September or early October, we'll start production. We should be seeing our trucks in showrooms available for sale by the end of this year." Global Vehicles has signed more than 300 dealers to sell the Mahindra, which would be the first Indian-made auto to reach the United States. The truck, which has a four-cylinder diesel engine, meets the EPA's stringent new requirements for diesel emissions, Goenka said. The pickup originally was proposed for a mid-2009 introduction. 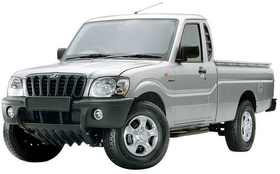 That was pushed back to December 2009 and then February 2010 as Mahindra conducted 90,000 miles of road testing. Goenka acknowledged dealers have been restless after repeated delays. "The shift of timing has made them a little edgy," he said. "They want to get started. We keep getting e-mails from customers saying they want to buy our truck. "But you have to understand, we're only going to get one chance at this. We have to do it right. So we have focused very heavily on testing."